THE SCORCH TRIALS is in! I tweeted this yesterday, but I have officially turned in THE MAZE RUNNER's sequel to my agent and editor. Like any good author, by the time I clicked send I wanted to murder the book, beat it to a pulp, smash it and smash it so no one could ever read it. That's the point when you know it's time to pass the dumb thing on. I will now spend the next few days lying awake at night, staring at the ceiling, imagining in my dark mind the many reasons why they will hate the book and ask me to rewrite the whole thing. All authors are this neurotic - at least the ones I know. No, it's not as bad as I'm making it seem. Almost though! Anyway, no time to relax. I have roughly a month to finish the third book of THE 13TH REALITY. I'm getting close to the stretch drive of the book, where everything stampedes toward the big climax. So it's gonna be fun. Thanks for the questions in the comments of the last post. I'll save that for Monday, since that always seems to be the day we get the most hits. If anyone has a question for me they'd like to add, feel free. My very long-timers will remember a time when I used to quote music lyrics a lot. Maybe I'll start that up again, at least every once in a while. Here ya go, and have a great weekend. 1. It looks like the release dates for the paperbacks of Book 1 (December 22, 2009) and Book 2 (February 23, 2010) of THE 13TH REALITY are now official. You can see the dates and preorder them on the Simon & Schuster website. CLICK HERE. Hopefully we'll see the new covers soon, too! 2. I still haven't heard from two of our ARC winners: Brooke Reviews and The Brain Lair. So if you tried to email me, I didn't get it! If anyone knows them, please pass the word that I need their address. 4. Speaking of dark, just finishing up GERALD'S GAME by Stephen King. Yowza. Not recommended for anyone under the age of 36. 5. So, I hurt my knee playing basketball a few months ago, and I've been putting off going to the doctor even though it still feels really weird. I keep hoping it's okay. Well, last night I ran 3 miles for the first time since the injury and everything seemed okay. Felt great, actually. But there's still something... off about it. Keep your fingers crossed. Guess I should just go to the stupid doctor, huh? 6. Can you feel it? Can you smell it in the air? Are you enjoying those tingles that shoot across your skin every time you think about it? Oh, you know what I'm talking about. I don't even need to say it, but I will: football is just around the corner. Every year when we approach August - that's when I start to feel it. Ah, yes, there is a light at the end of the tunnel. It is coming. 7. I'm already signed up for 3 fantasy football leagues with various groups of friends/family. Yes, there is definitely something wrong with my brain. 8. My agency sent me all these tax forms I have to fill out since we're selling rights internationally now. Is it normal that when I look at them I want to vomit? Just curious. 9. If anyone has a question for me, leave it in the comments. Maybe my next post can be a Q&A. I need something to blog about, so help an author out. 10. Have I ever mentioned that I like the number ten? Well, I do. First of all, I really appreciate the big participation in the ARC giveaway last week. I've been thinking ever since I posted the contest that it was kind of pretentious to make you follow me on twitter etc. Its purpose may seem obvious: I want to promote my books as best I can. But, I can honestly say that my favorite part of being an author is keeping in touch with my readers and hearing from you. So that was an equally big reason. If the five of you would please email me at gmail dot com with your address, we'll be set. The gmail name is dashnerjames. Thanks again - and I'm really sorry everyone couldn't win. But hopefully we'll have more chances soon. UPDATE: I may have good news about upping the number of ARCs to be given away (see #8 below). Stay tuned. 3. Book 3 of THE 13TH REALITY is now over 60,000 words. Tick just did something you won't believe in Chapter 33. 4. I signed up for Twitter a long time ago but haven't ever really used it. I'm gonna give it a shot, throwing out a tweet when I have ridiculous and embarrassing thoughts. Or when something cool happens. And for announcements and updates. 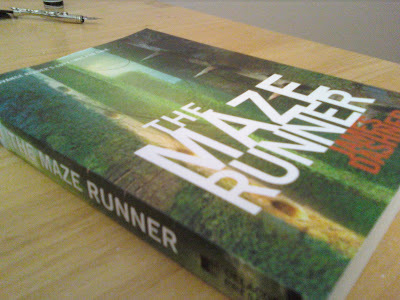 My Twitter name is jamesdashner, and to follow me, CLICK HERE. 5. I'm also on Facebook, where you can friend me or "become a fan." How pretentious. 6. Also, make sure you become a follower of this blog! Just scroll down the right side of the blog here until you see the "follow" button then click it. 7. This all makes it sound like the Internet is consuming my life. I promise it's not - writing books is my main goal in life. This blog is the central point of keeping in touch with you guys, doing it two to three times a week. Everything else is just peripheral (wow, such big words) and takes very little time. 8. Okay, I have in my hands a nice shiny ARC (advance copy) of THE MAZE RUNNER, from the reprint Random House did with the actual cover (the cover wasn't complete in time for the first printing, which just had a black background with white letters). I'm going to sign and personalize this puppy and mail it to someone. Here's how to enter: sign up to follow me on at least one of the three things mentioned above (twitter, facebook, blog) and then leave a comment on this post telling me you did it. And to keep the comments from boring us to tears, you also have to briefly tell us about the last book you read and whether or not we should also read it. (If you don't want to enter the contest, you can still do this last part!) UPDATE: A commenter had a good idea: you get one entry for each of the three things you do. We're going away for a couple of days, so I won't be able to post again until Monday. The contest is open until then and I'll announce the winner. I will, of course, make sure the eventual winner did indeed sign up for something, so as to keep it fair to all those who really make the effort. Man, seems just like yesterday I made a big deal about going below 100 days till THE MAZE RUNNER's release date. And now it's only 77 days. It's coming! 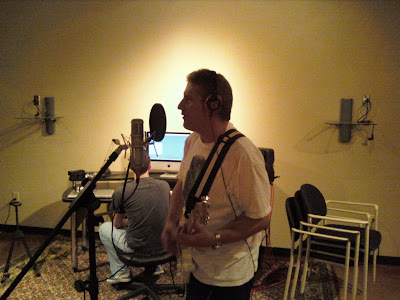 My brother Paul is excellent on the guitar. 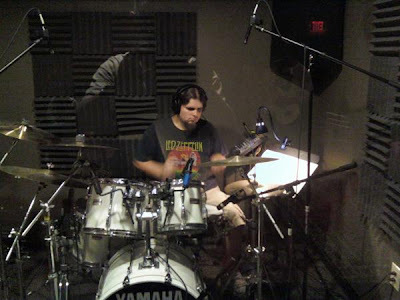 My nephew Matt is attending the Atlanta Institute of Music to become a sound engineer. He's also incredible on the drums and guitar. And me? My friend in high school had a full set of drums and I dinked around on them. Yeah, I was by far the least talented of the group. 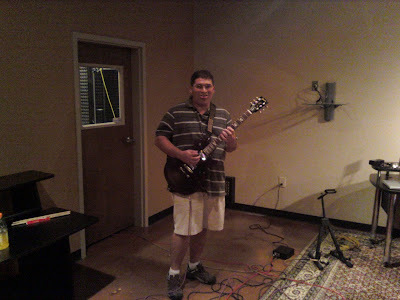 Anyway, Matt was able to get the recording studio at his school for the day, and we jammed. David wrote the song, and it was awesome. I mostly sat back and watched, but I did play the drums for about an hour while my brothers messed around on their guitars. I loved every single second of it and I've already asked Santa for a drum set this Christmas. Since it's now in Publisher's Weekly, I think I have permission to tell you guys what Random House has announced as our first print run. You can see it for yourself: CLICK HERE, or I can just tell you: 100,000 copies (hardback). I love seeing people's reaction when they hear this number. Most people aren't very familiar with the book industry, so I can just tell what they're thinking in their minds: Well, that's not very impressive now is it. I mean, Harry Potter and Twilight had first print runs in the millions. What a stinky, stinky boy. It all depends on what you compare it to, I guess. But just trust me that my agent and I are extremely excited about this announcement, and it's a very good sign that initial book orders are strong. Now we just have to hope people buy all those books! Moving along, if you missed it on Monday, we announced the sale of MAZE to the Greek publisher, Platypous. That means we now have three foreign rights sales (Russia, France, Greece), all of whom bought the entire trilogy. I don't know why, but the thought of my book in other languages is definitely one of the coolest aspects of my career so far. Hopefully we'll see even more. Thanks again for all the awesome comments about how strange the Dashner Duders are. I really, really enjoyed reading them, and so did my family. Feel free to continue if you think of something else! Here's another one for me: I always sleep with a fan, year round, no matter how cold it is. I became addicted to it growing up in Georgia. It's mainly the noise that puts me to sleep - drowns out everything else. Ah, pure bliss. Oh, and you can bet my wife just LOVES this about me. We sold Greek rights to THE MAZE RUNNER trilogy! I was very excited to hear this from Lauren Abramo at my agency last week. (Thanks Lauren!) It just seems cool. Storytelling has such deep roots in the country of Greece, not to mention all of the history. I can't wait. Somebody out there tell us what the title will be in Greek. The publisher is Platypous, and they've recently published TWILIGHT and THE HUNGER GAMES, so it's great company to be in. Looks like they're very excited and will try to get the first book out by spring of next year. For those of you who missed it, we had a fun weekend of people telling us odd things about themselves. We had an OCD tighty-whitey guy, a real vampire and, my personal favorite, someone who loves "blood and body organs and guts and stuff like that." I couldn't make this stuff up. Since a lot of you were out doing less important things than hanging out at the Dashner Dude this past weekend, let's continue the confessions. Tell us something odd or unusual about yourself! Well, now that we're all settled into our nice new house, I'm leaving for a week. Goin' home to Georgia for the Dashner Family Reunion (which is basically my immediate family and nephews and nieces - there aren't many Dashners in the world). Since we won't be doing much but sitting around eating Doritos and making crass jokes, I hope to get some writing done and keep up with the bloggermeister. So stay tuned. Maybe I'll do some pictures. By the way, The 13th Reality Book 3 is now about 55,000 words, for those of you scoring at home. Also, I'll be posting some good news on Monday. I'll start: The old-timers already know this, but I refuse to watch movie previews. They ruin the movie every time. This takes a lot of effort and meticulous planning, but somehow I manage. I know it's been a whole week since I posted, but I have an excuse: We moved. Anyone who has ever moved feels our pain and understands. Thanks. But I'm back! So you would think I have a ton to talk about, but I just spent three entire minutes staring at the computer screen. Is my life really this dull? Or maybe I'm gaining a complex about people actually being interested in what I do every day as an author. And I feel like I'm starting to repeat myself. Or "brag" too much with the good news. 1. Finally saw Transformers 2 last night. It offended me on two levels. First, as a writer. The jokes just weren't funny. And there were a LOT of jokes. Including from the robots. Joking robots. Wow. Which leads me to the second level. All those silly robots, you'd think it's a kid's movie. WRONG. Now, anyone who knows me knows very well that I'm not a prude. Far from it. But the off color and raunchy jokes in this movie not only were stupid and non-funny, they were inappropriate for kids. I groaned and rolled my eyes so often, I think I made myself kind of dizzy pukey. Having said that, I still had a good time watching all those amazing special effects and lots of things blowing up. And the sounds. Loved all that mechanized sound. 2. As part of our move, we had to, um, get a new TV. Right? Of course. I did decide to stay reasonable and modest by only getting a 55 incher. Har har. Hey, I don't make many splurge purchases, and in eleven years of marriage this is only the second TV I've ever purchased. So there. 3. I thought I was getting a plasma TV, and it wasn't until 2 days after I'd bought it that my brother-in-law Chris happened to actually look at the box and tell me it was an LCD. I swear the dude at Best Buy told me it was a plasma! I felt like such an idiot. 4. Whenever I talk about stuff like that I feel kind of horrible because it's so trivial and shallow and the world has much bigger problems. But, quite honestly, TV and movies are a huge part of my inspiration for writing, and without my writing, I can't help kids read and make money so I can donate to charity. True that. 5. 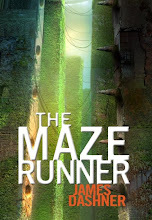 My agent (Michael Bourret) found out what my first print run will be for THE MAZE RUNNER. He told me I can't tell you. See how mean these pub types are! But I'll just say this: it's big enough that you'll be able to find out in Publisher's Weekly. Did I just type that out loud? Oops. 6. Speaking of MAZE, do you realize it comes out in 90 days? 90 days! That's nothing. Reminds me of a Seinfeld episode. This month is July, and that always goes by fast. September is nothing - flies by with school starting and all that. August is the end of summer, so it's over before you know it. Only a few days in October. So, it's like 20 minutes really. 7. Working hard and heavy on Book 3 of THE 13TH REALITY. On pace to have it done by September 1st. I'm trying desperately to make a decision on the ending. A slight tweak would make it really, really cool, but slightly cliff-hangerish. It's killing me!!! I so want to do it. Probably will. 8. The Deseret News did a really nice article on me if you'd like to read it (it'll be in the actual paper this Thursday). CLICK HERE. 9. Preseason football starts in about a month. Everyone together now: Yippee skippee!!!!!!! This is indeed the Year of the Falcon and the Dawg. 10. I must have some kind of curse. Random House went through a ton of versions of the cover for MAZE before settling on the final one (which I love). Now it looks like Simon & Schuster is having the same issues with the paperbacks for 13th. They wanted something different from the hardbacks, got an artist, didn't think what he came up with was right, have moved on to something else. I'm just thrilled they're taking it so seriously! Can't wait to see the final verdict. 11. Why do I have the feeling that Michael is going to call me sometime today and tell me I put too much info on the blog again?